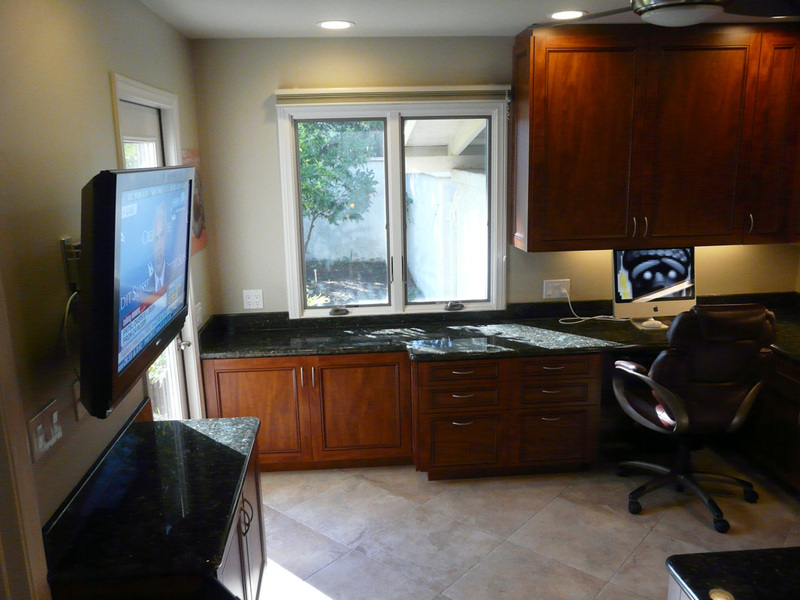 This home was built with a very small office or potential maid’s quarters located next to the garage and hallway that leads to the laundry room and kitchen. 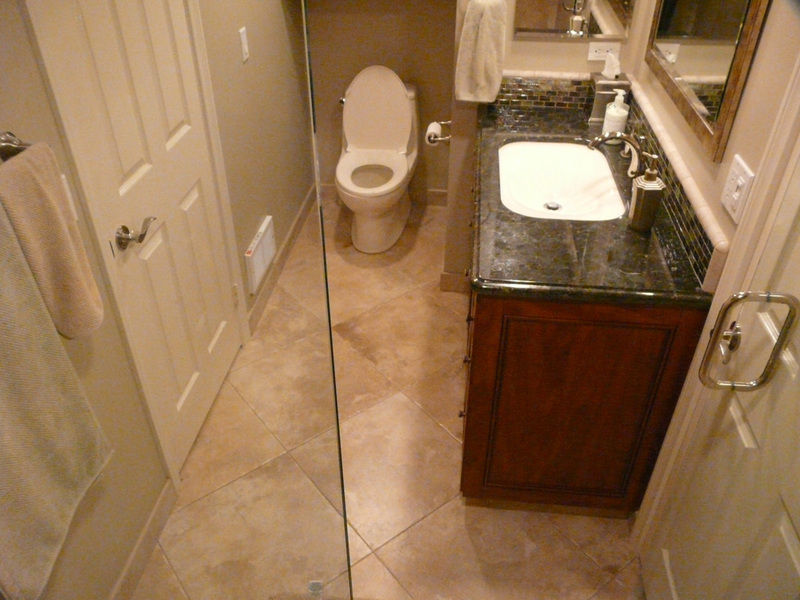 It was a very long and narrow hall. 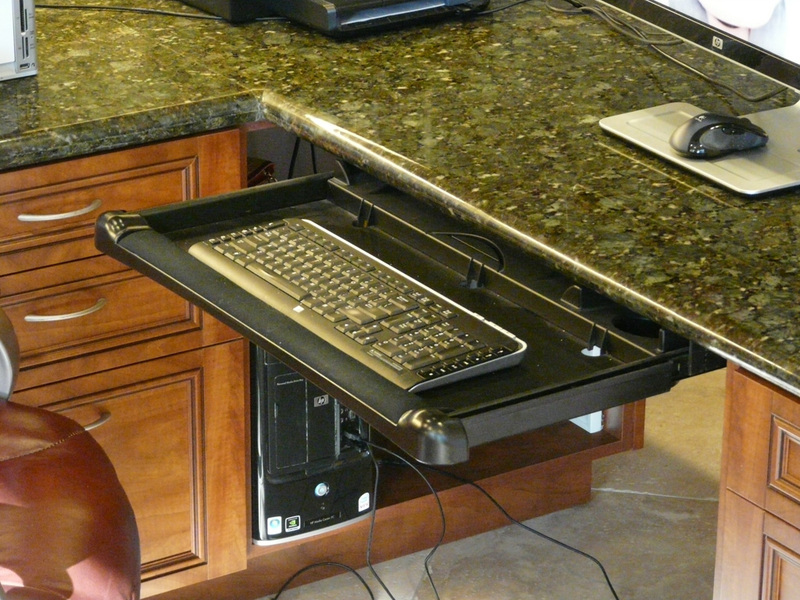 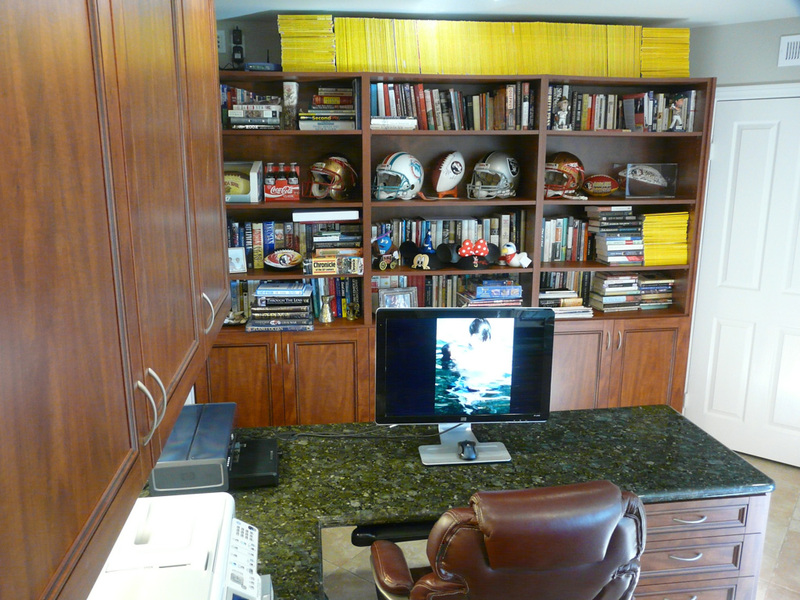 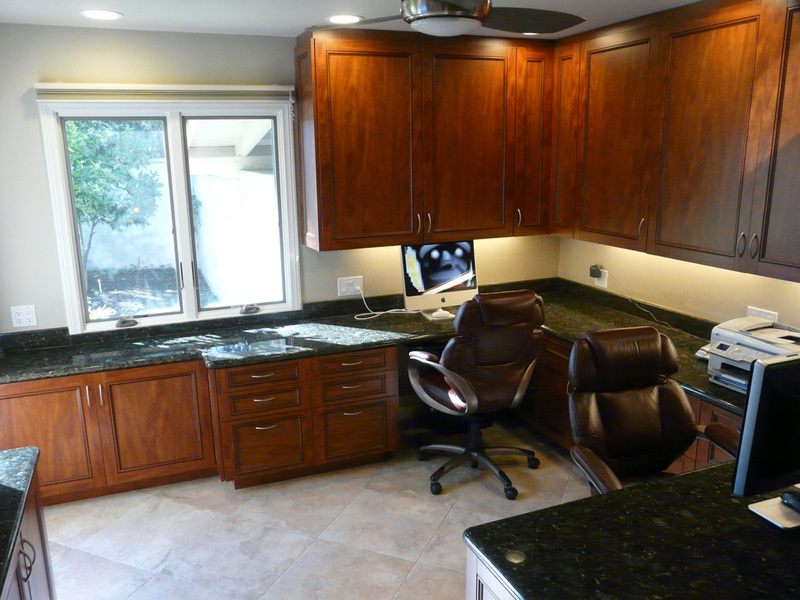 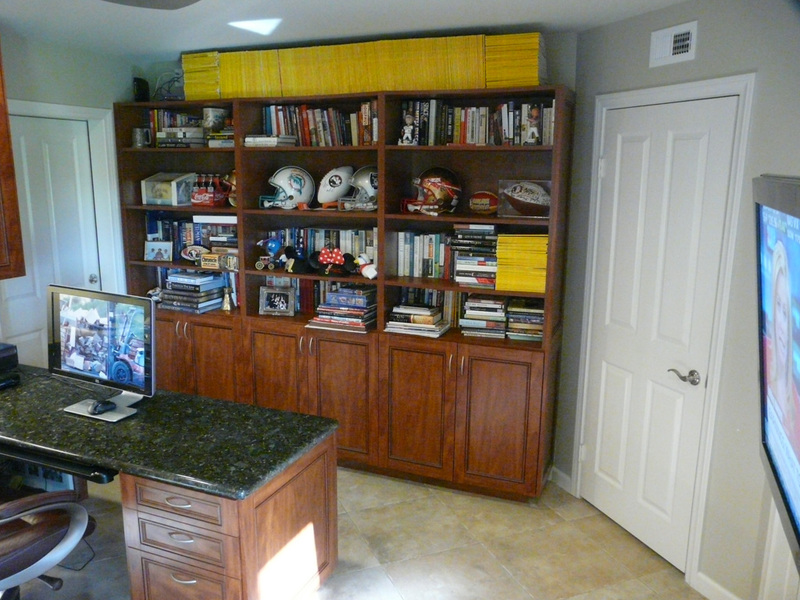 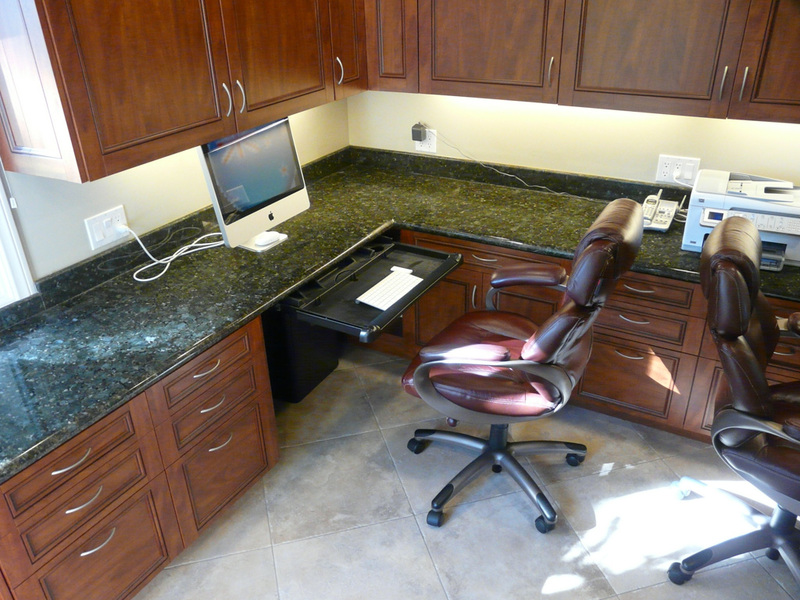 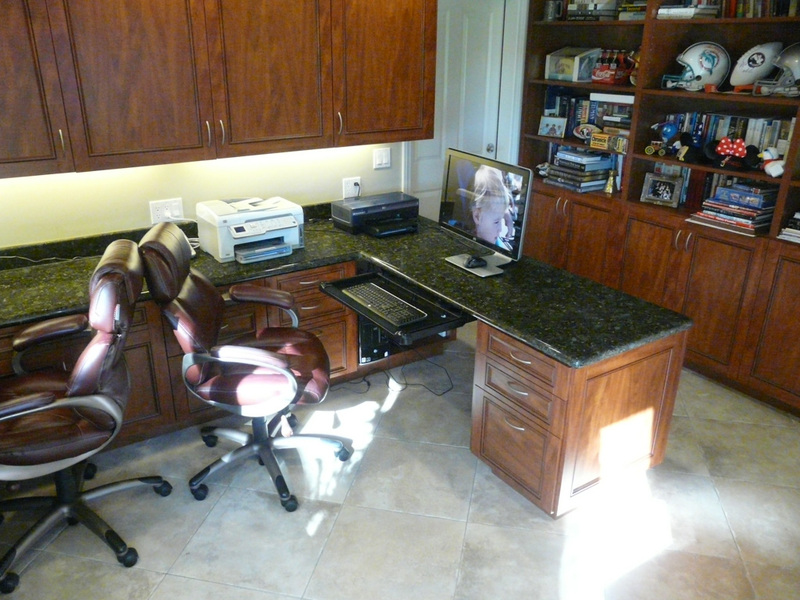 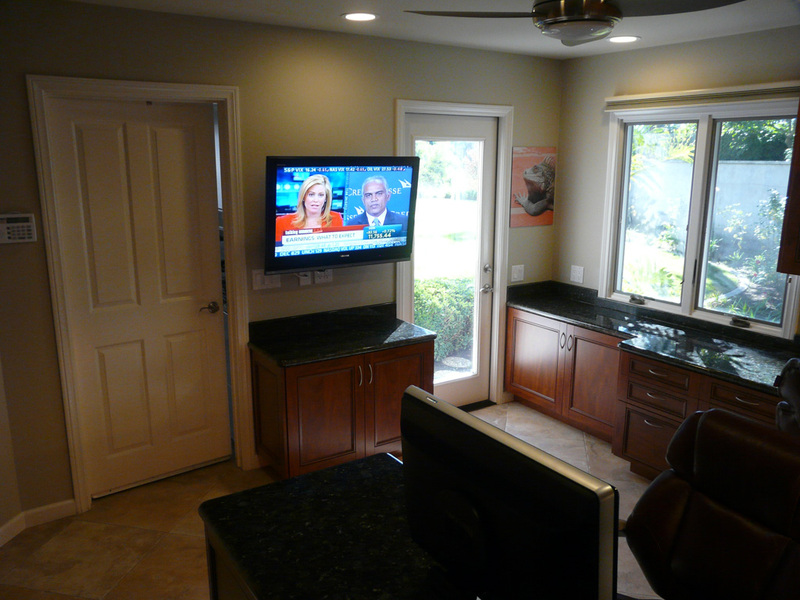 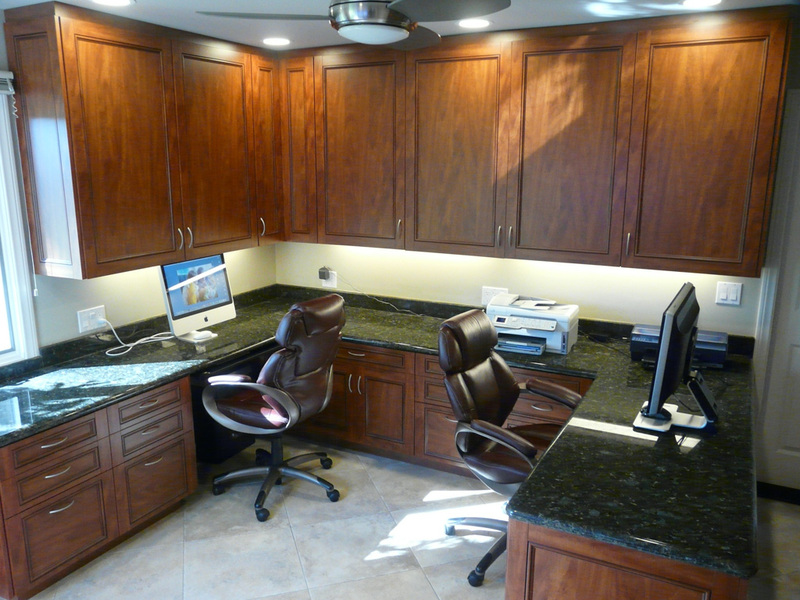 The clients wanted to have an office in which both the husband and wife could have a workstation. 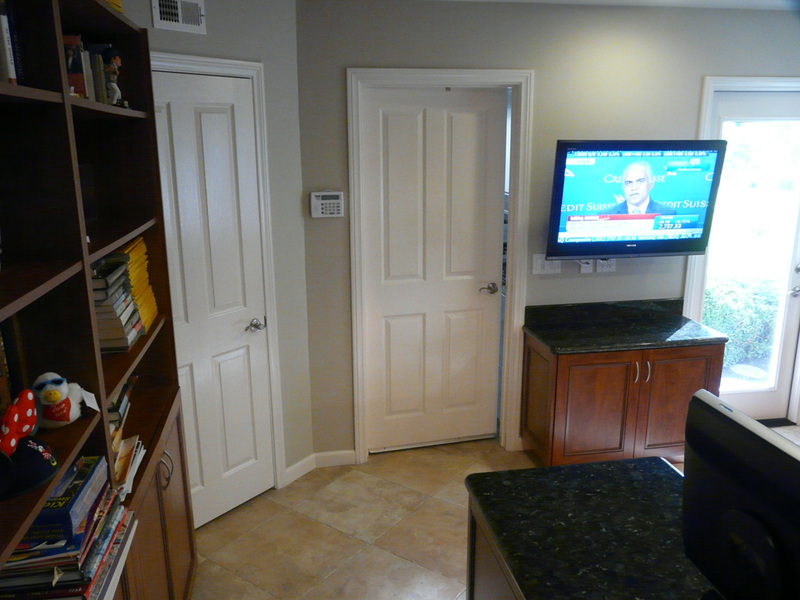 The solution was to remove the wall between the office and hallway to create a larger more comfortable room that still acted as a path to the laundry and kitchen, but was now large enough to create a very comfortable office for two. 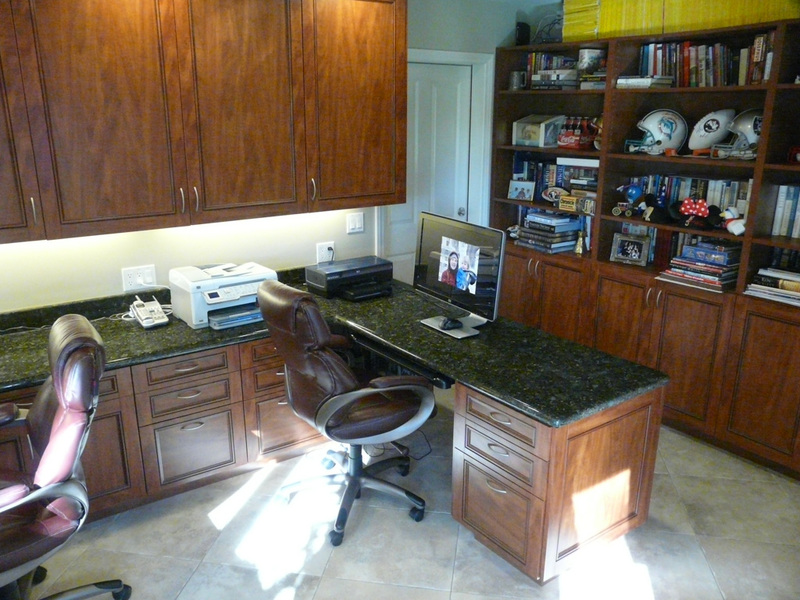 I hope you enjoy looking at this office as much as the clients do using it. 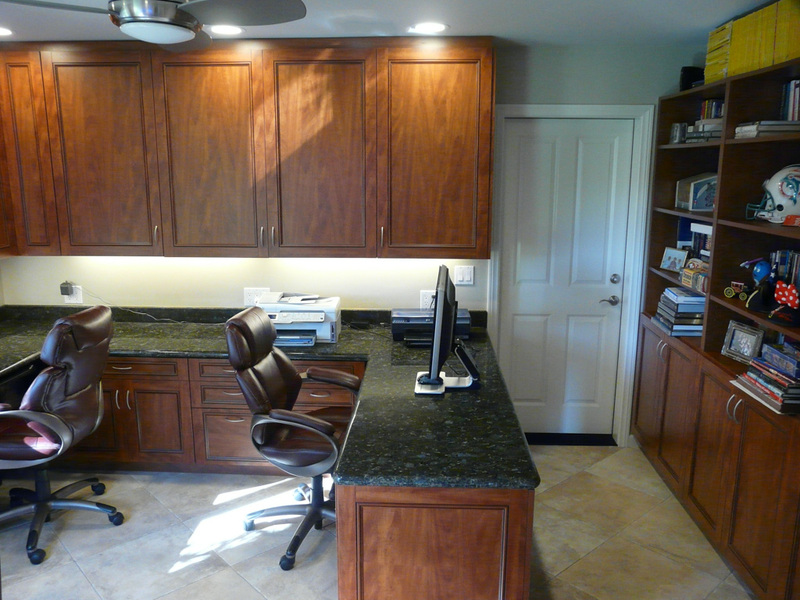 They tell me, with the exception of the kitchen – family room area, they spend more time in this office than anywhere in their home — and even the time spent in the kitchen family room has dropped considerably. 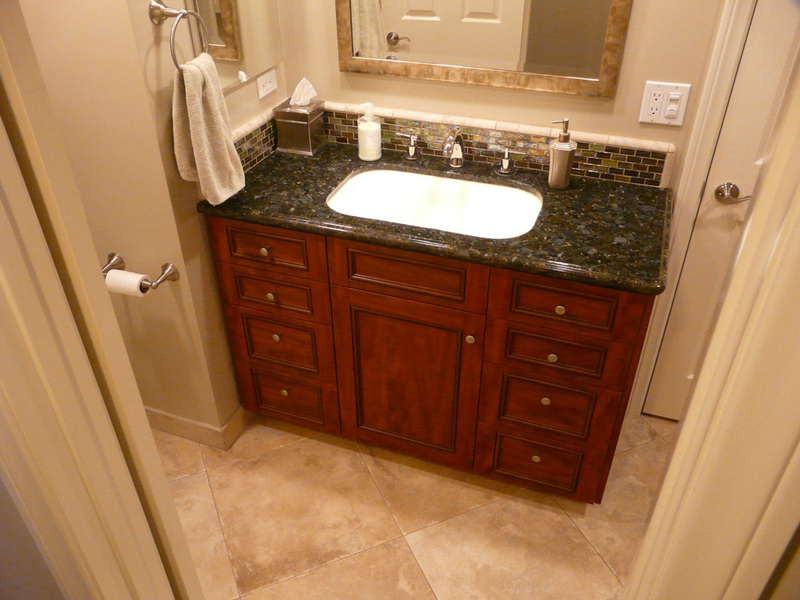 The client likes the richness of the dark cherry wood look. 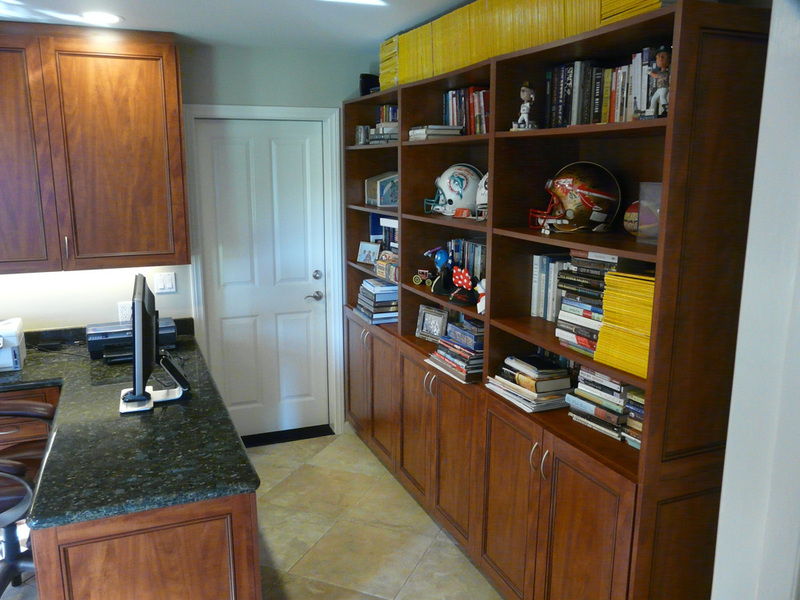 When I showed them a sample of the glazed cherry thermofoil door we used, they could not believe it was not real wood. 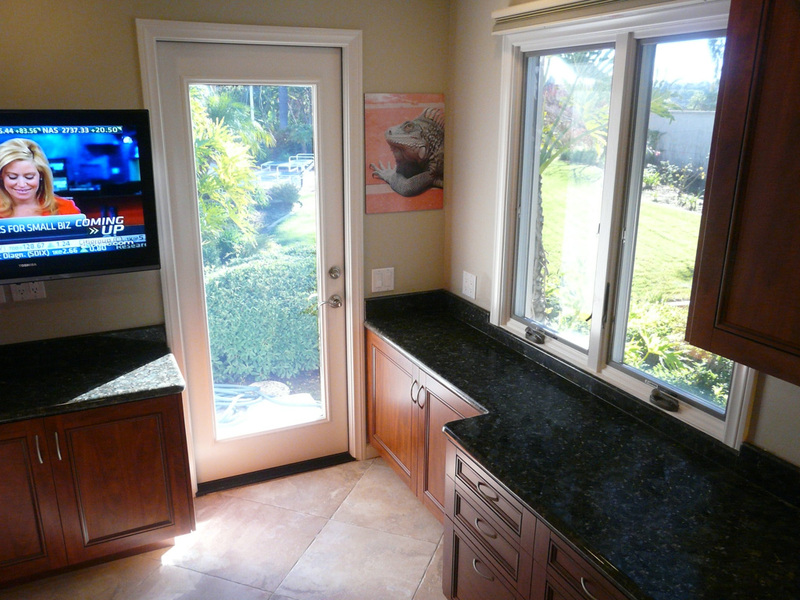 I priced both real wood and this thermofoil alternative for the client, and while the significant difference in price was most certainly a deciding factor, more than anything they really preferred the look of this door over any of the real wood ones they had seen. 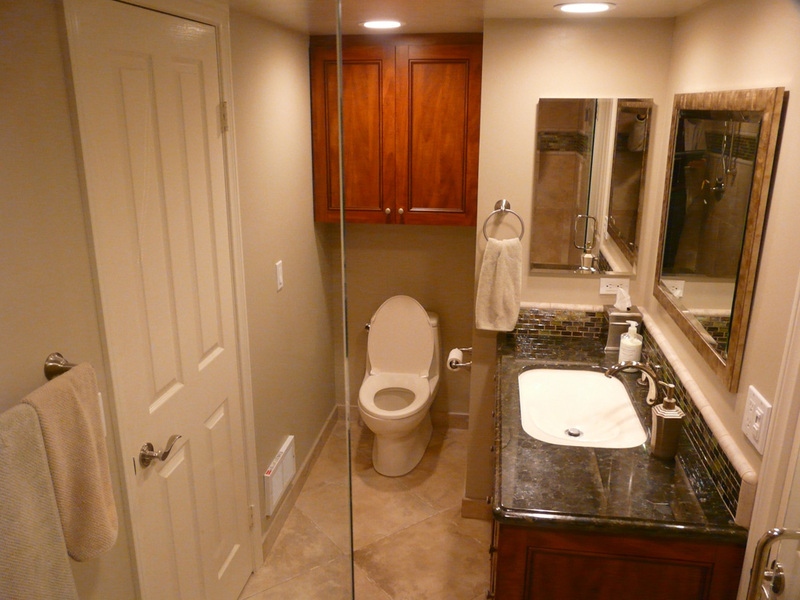 They wound up using the same door in the powder room as well. 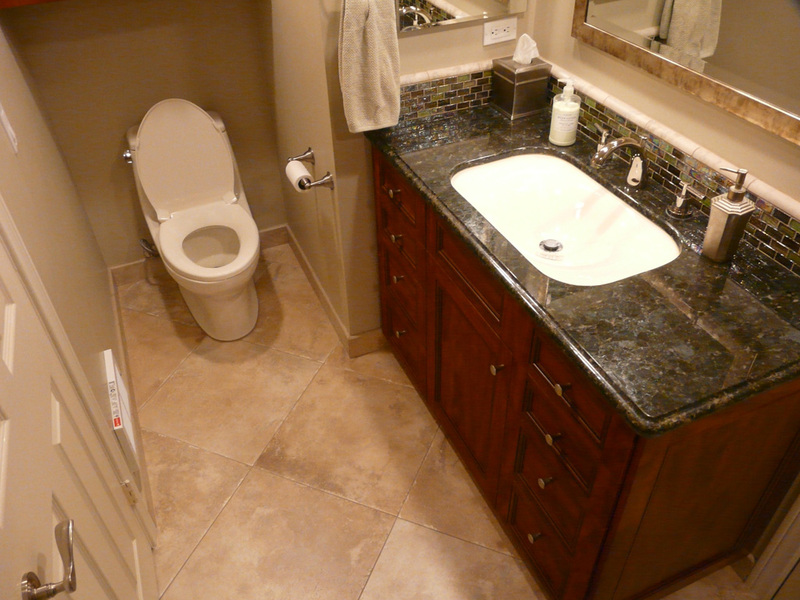 The powder room guest/bath combo is in the same configuration it was before we started this project, it was just given very significant upgrades in materials, aesthetics, and function by employing many of my functional bath design concepts. 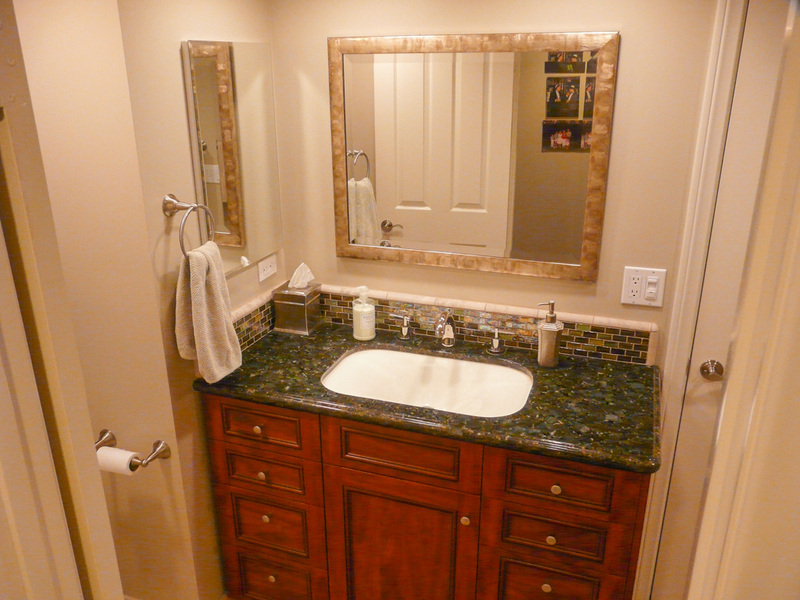 The storage next to the sink is not as important in a guest bath as it is in one that is used daily, so the medicine cabinet to the left of the sink is ample for this bath. 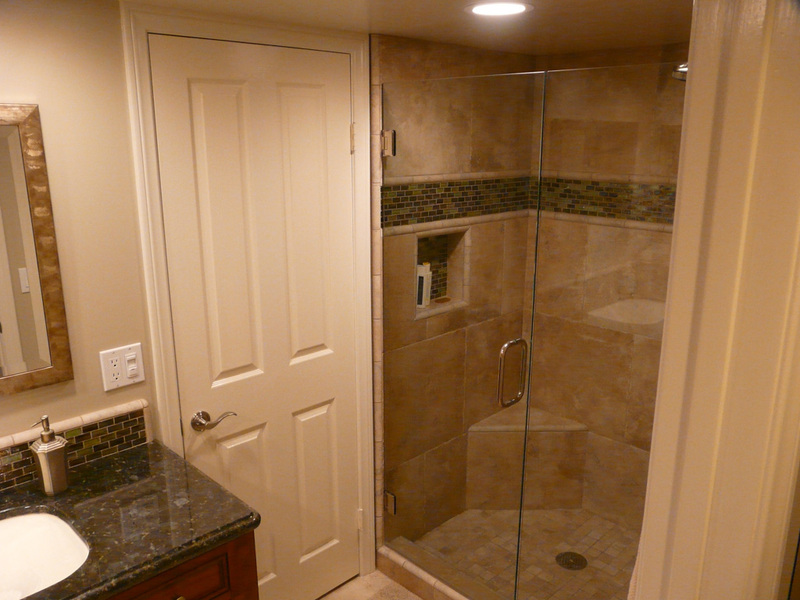 The heating and venting changes all follow my functional bath guidelines. 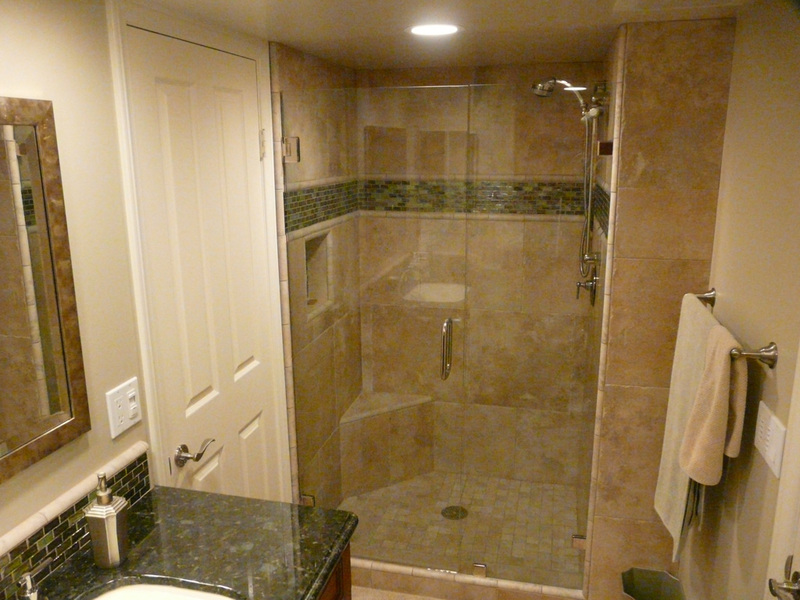 Although the shower could have been done without a door and using a pony wall with hidden shampoo shelf, the client chose not to because the shower would rarely be used, so the shampoo shelf would likewise rarely have anything on it. 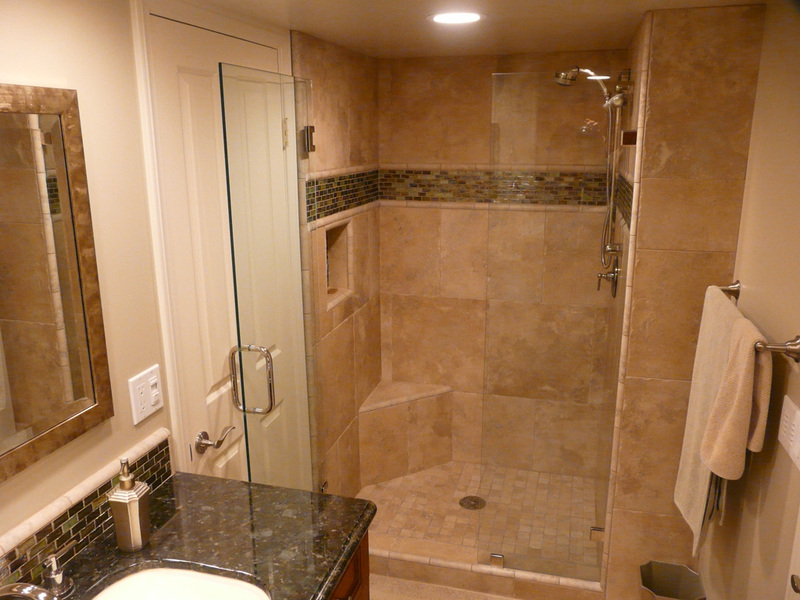 In turn, they opted for more glass and to give a larger view of the tile work in the shower. 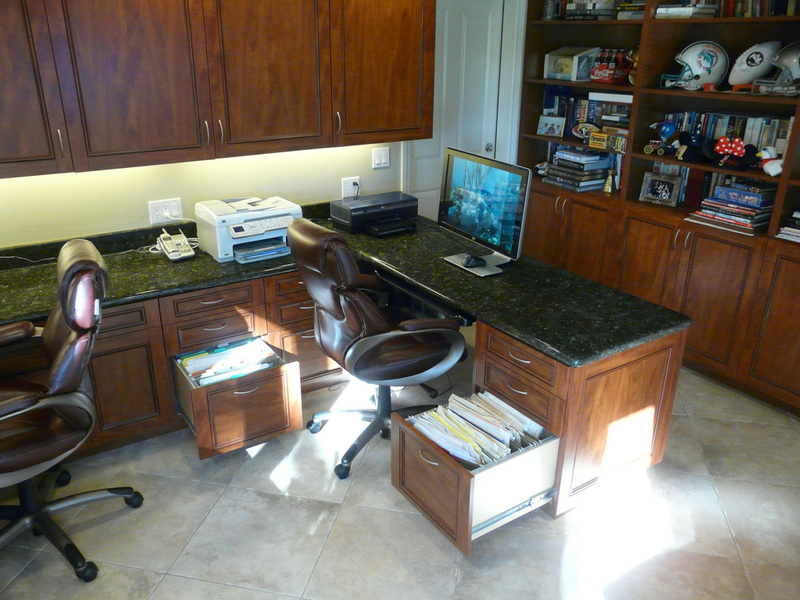 Notice the placement of the LED recessed down lights over the countertops as you look around the office and bath, they are not in the typical brain-dead architectural geometric pattern seen in most magazines. 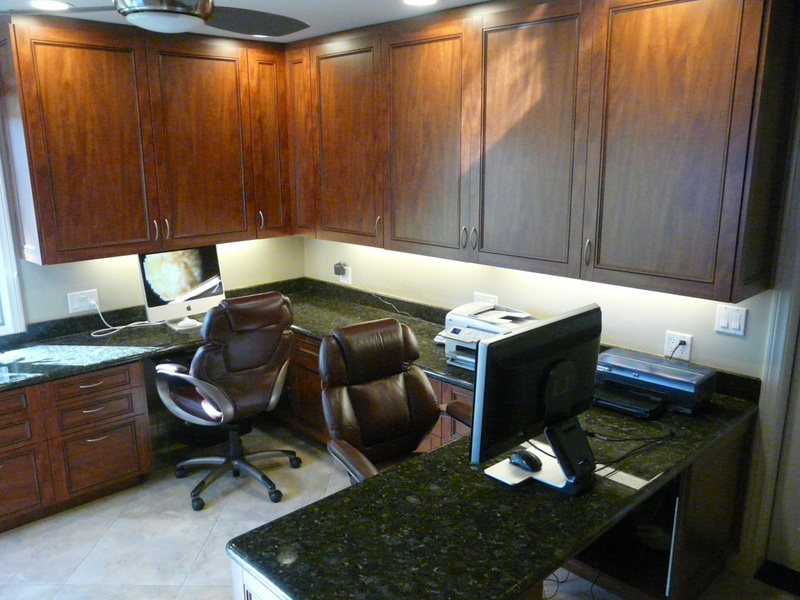 These lights are placed where they are needed over work spaces, in front of cabinets so the cabinets are highlighted and you are not standing and working in your own shadow like you would if the lights were behind you in a geometric pattern in the ceiling. 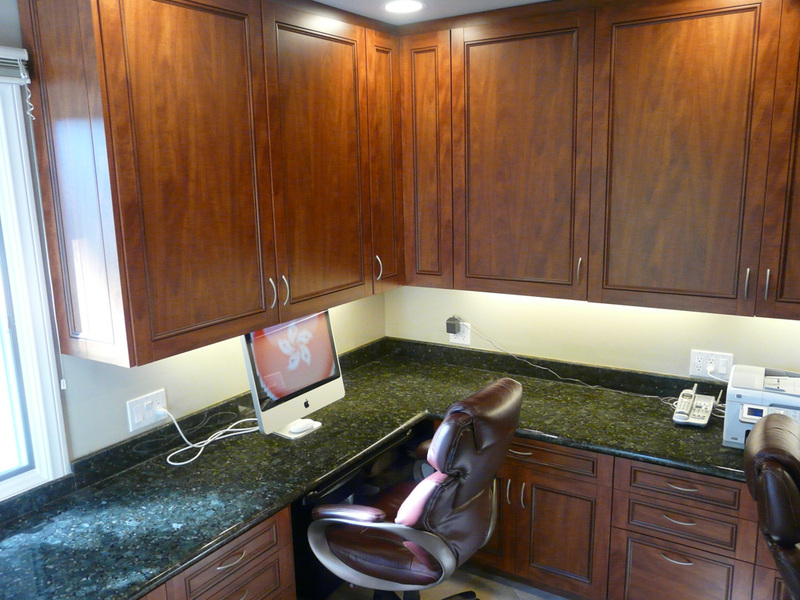 We also supplemented the lighting with under cabinet fluorescent lights in the office. 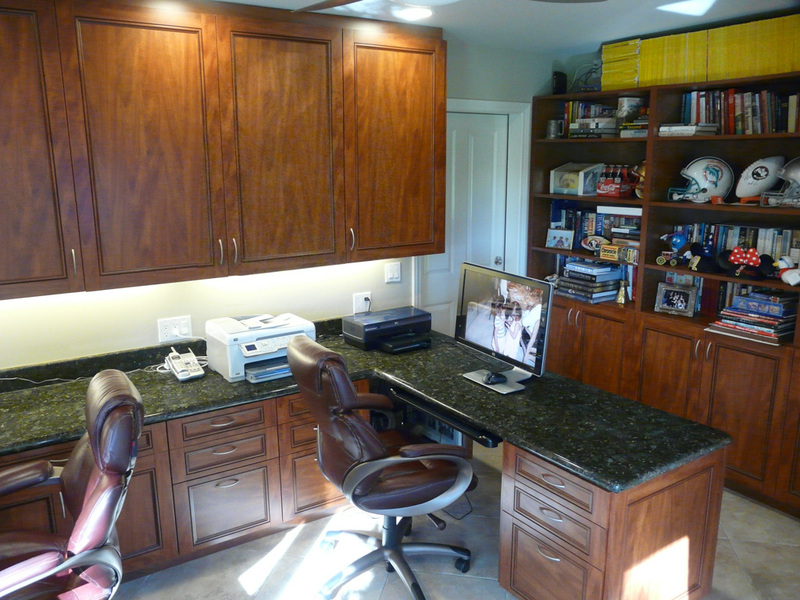 The only thing needed to day to update the office would be to replace the under cabinet fluorescent lights with new LED versions.